Hmmm, I'm not sure about this one. In my head, it was gorgeous, but in execution I can't decide if it is cute or 'country craft fair'. I think it has everything to do with my fabric choices. Maybe a little too pink? Am I being too harsh? Anyway, I like the idea and plan to try it again. 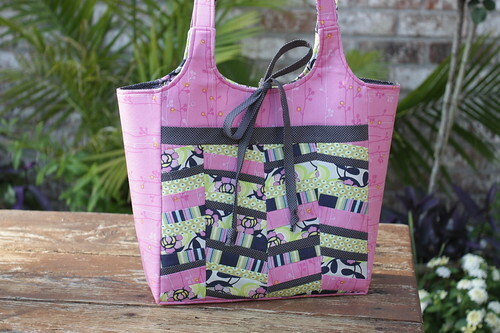 This bag was made from my Ava Rose pattern. 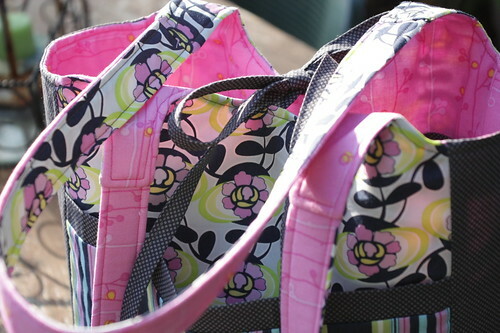 It is fully reversible with a pocket on both the outside and inside. I'm not really a fan of the tie closure, but for a reversible bag, it works. You may remember my zig zag quilt from last summer. Ever since I made that I've wanted to revisit the idea. Right now I have an ivory/beige/white version in the works (in my mind), but I wanted to figure out a way to make those diagonal rows easy. 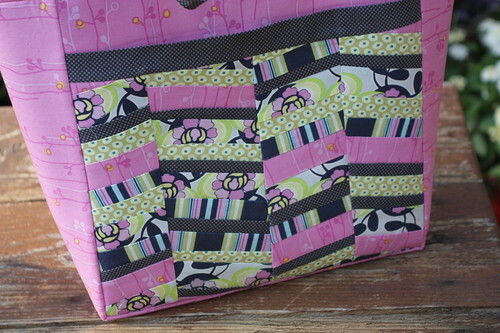 When I made the quilt, I sewed the strips together to make a rectangle, then cut rows on the diagonal. For the bag, I tried using paper piecing. I think the paper piecing is a good option for small pieces, probably not on a large scale like my quilt. Maybe I'll make some pillows to play around with the idea some more. I know I could use the triangle method that most zig-zag quilts use, but I like the skinnier, irregular lines of my versions. I don't know, maybe I like the reverse side better? Yes, I think it is definitely the pink that is throwing me off. I usually gravitate to pink, but this time it isn't doing it for me. I wonder if this one is a little too pepto? 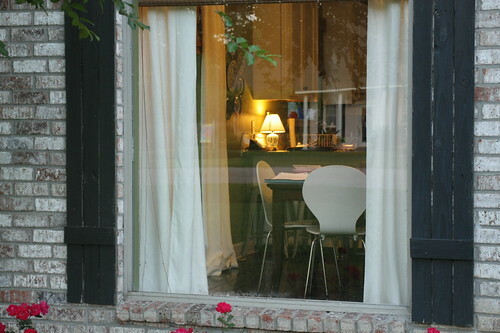 Anyway, are you like me in that you enjoy peeking into windows around the neighborhood at dusk? Nothing perverted (ha! 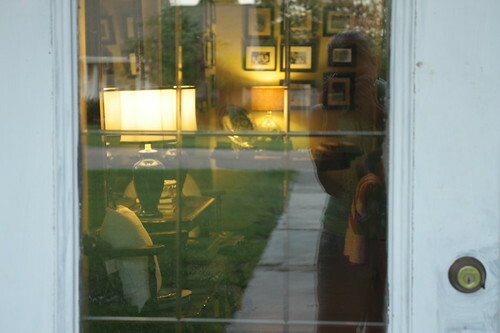 ), of course, just a little peek at the interior of the house? I love doing this. Last night I was walking towards my house after getting the mail and I got a little peek at my own interior. It wasn't so bad! Just excuse the primed front door - we're painting soon. On Saturday morning I was the first one up, so I took advantage of a quiet house. I pulled out my old pattern and got to work. This pattern, McCall's 8017, is from the mid 90's, back before I learned to trace my patterns, so it was already cut out. This would have been a good thing if I were the same size I was back then (i wish!). So, I traced the pattern and added a bit here and there. I can wear it, but I should have added more! It's a bit too snug across the bust and back. I have quite a broad upper body, so this is no surprise. Next time I make this I'll do a full bust adjustment and add some width to the upper back. The good news is that the hips were perfect. When I started sewing this up, it dawned on me that there was no back vent. Did my early 20's self eliminate that part? No, I had cut out the mini dress version. I'm sure I could easily pull that off back then, but at almost 35, um, not quite. There wasn't even enough length to do a hem, so I bound the bottom with packaged quilt binding. By doing this, I was able to add a little bit of length. 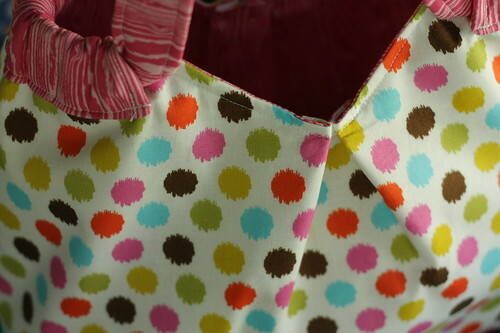 To eliminate the facings, I used bias binding on the neck and arm openings, which matched the hem. Lucky for me, this packaged stuff matched my fabric perfectly. This isn't my favorite fabric, but I liked it enough to use as a muslin. I normally wouldn't have finished a muslin like this one, but the fit was good enough for me to carry it through to the end. With my fitting tweaks, I feel like the next version is ready for the good stuff. I think I'll try doing an invisible zipper at a side seam, but I need to refresh my memory first - it's been a long time since I've done one of those. I didn't get as much sewing done as I wanted because that bad weather we were supposed to get ended up passing us by. By the afternoon the weather was gorgeous, so all attention went to working in the yard. I'm happy to say that my patio is almost finished! All I need are a few more throw pillows and some filled out window boxes, then that's it. Hopefully I'll get it done before it turns into a sauna outside! P.S. we made our jam! **new shoes for Ava-roni. Salt Water sandals are the BEST for skinny, narrow kid feet. She had to have them in hot pink, of course. Oh boy, Friday, am I ever ready for you! This wasn't a particularly stressful week or anything, but I am so ready for the weekend. I think it's just spring fever. There simply isn't enough time during the week to kick back and enjoy this glorious weather we've been having. Of course it is supposed to storm and rain this weekend, but that's okay. My garden and flowers need the rain. **real life - laundry hanging on the door frame, baskets of laundry behind me, child whining about something. Do you like my new camera strap from Erin? 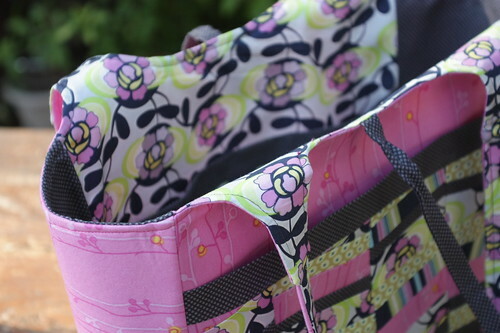 With rain on the horizon, I won't be able to work on my patio, so I think I'll do some sewing. I've been needing to make myself some dresses. Usually at this point in the year I've already made myself a dress or two, plus there's a birthday dress to make (can you believe Ava will be 4 in a week???). 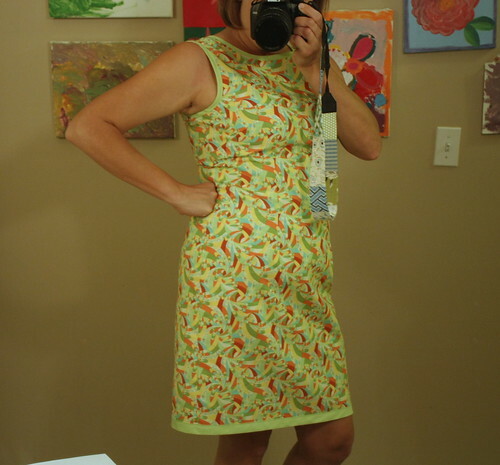 I pulled out the dresses I made for myself last year, but I've lost about 30 lbs since then, so they're huge on me. I may be able to salvage something out of them, but they pretty much need to be scrapped and re-made. Don't get me wrong - I'm not complaining! I must confess my ignorance. 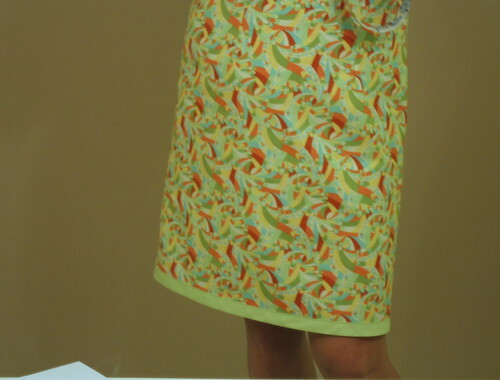 I've mentioned numerous times that I want to make myself some shift dresses, but what I really meant was sheath dresses. With my shape, I'm pretty sure a shift dress would look like a maternity dress - definitely NOT the look I'm going for! After pouring over the pattern websites, I couldn't find anything that I wanted to make, so I went through my old pattern collection. I found a pattern from 1997 that I think will do the trick. I used this pattern to make a dress for my bridal shower (back in 1997). Everything out now with the shape I'm looking for has some sort of waistband - I don't want a waistband. Maybe that means I'm out of fashion, but I don't care. I know that this style looks good on me and they're simple to put together (no fiddling with a stupid waistband that will be too small because I have no waist!). Bust darts and waist darts are my friend. **I found this great HEAVY wood framed mirror this week while thrifting - $15. I'm not sure it will live in this particular spot, but I couldn't pass it up. When I started thinking about what I wanted to make last night, a bag isn't what I had in mind. I really wanted to start on a quilted pillow, but I didn't have the time for that. I wanted needed some instant gratification, so a bag it was. Do you kinda sorta recognize the shape? It's my Round Yoke pattern. 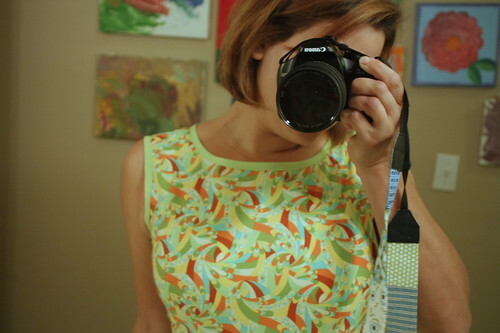 I used the back/lining piece for the body instead of the front with the inset. I'm not sure this is the best shape at the bottom, but I was short on time, so I went with what I had. If I were to make this style again, which I'm pretty sure I will, I plan to do something a little different. I started out by extending the top about 2". 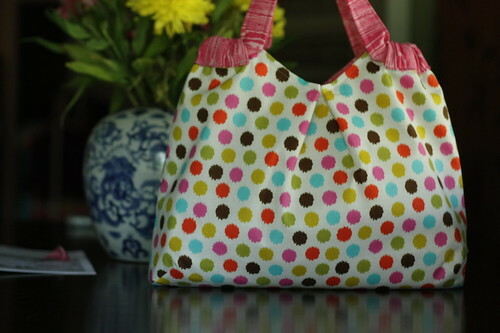 I made the exterior and lining exactly the same, then sewed them together just as you would any other bag. I then folded the top down at the sides to make a channel at each side. 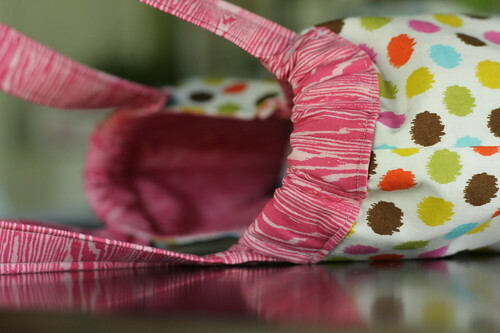 I made one long strap the width of my fabric (44"), threaded it through the side channels, then sewed the ends together. I thought at this point I was done, but it didn't look right. I tried scrunching the sides up to expose more strap, but it was still off - the handles didn't quite lay how I wanted them. So, I flipped the strap up at each opening at a right angle (I sewed the straps down at this point). That was better...but still a little off. The front and back gaped a bit, so I added a little tuck/pleat at the center front and back. That was it! I think it turned out pretty darned cute. 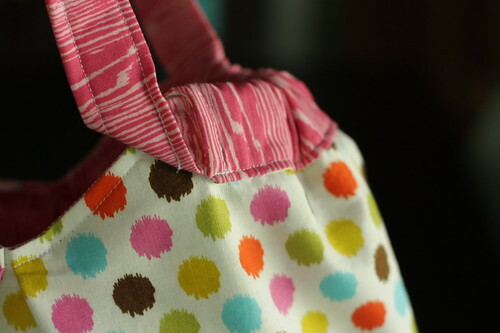 This one will probably go to my girls - it has no pockets or closure because I didn't want to invest the time on a prototype (I was going for instant gratification, remember?). 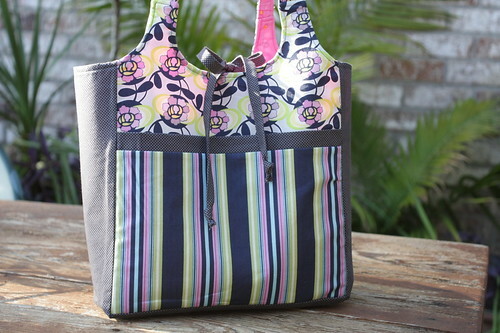 Wouldn't this style be cute as a large beach bag or market tote? I think so. Yes, the next one will be large...I can see it now!! Comment #16 was written by Lera of The Sky is Pink! Yay Lera!! Lera was one of my first blogging friends way back when I started this gig, so I'm super happy that she won. And now for my shop announcement :: SALE! Everything in the shop will be on sale until May 9th, Mother's Day. If a pattern is sold out in my etsy shop (I don't always get the patterns re-listed as quickly as I'd like), you can always purchase it here, which should never be sold out. Thanks so much for your support! 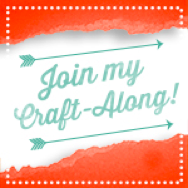 After my last shop update I lost my sewing mojo. It happens. Yes, I've sewn a few things here and there, but nothing major. My creativity has been occupied with painting furniture, and doors, framing beer labels, and making curtains (wait, that's major sewing, but not major fun sewing!). There are still lots of house related projects in the works, but I've been feeling the urge to just make something. Something pretty and sewn on my sewing machine. I think my fabric is calling me..if not the fabric, then certainly Richelle is. 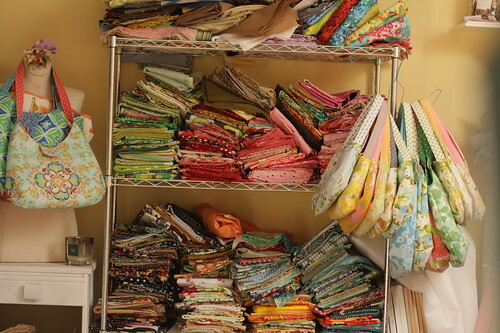 I haven't spent any time in my sewing room lately and everything up there is getting lonely. That seems plausible, right? 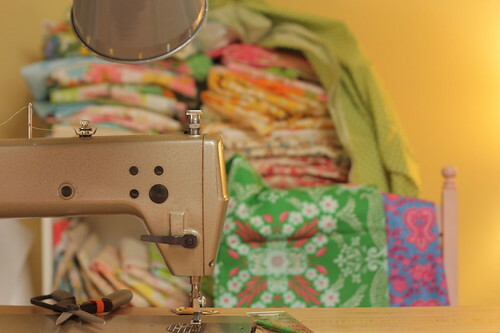 So tonight after t-ball practice and dance class when the kidlets are all bathed and in bed, I plan to head up to my sewing room for a date with my fabric and some Bravo TV time - 9 by Design, love it! Those people are crazy, but it's a kind of crazy I can relate to. Well, maybe I should watch a few more episodes before I make that proclamation, but based on the first episode, I'm hooked. So, if all goes well tonight I'll have something pretty to show you tomorrow (fingers crossed). One thing I can promise is that I'll be back with a winner to the Stitch drawing and I'll have a shop announcement. Happy Tuesday, all!! Ever since spring sprung around here, I've been on a mission to get my patio in order. This poor patio of mine, I feel like I'm fighting a losing battle. I started working on it a few years ago, but nothing ever got finished. Last year we finally (it wasn't the first try) got the pavers just right, now my attention has turned to making it pretty and pulling it all together. I spent the majority of my weekend working on the three doors across the back of my house, which all open to the patio. I now have 3 more black doors and 3 repaired & re-screened screen doors. Thanks to a cat and a little dog, the screen on two of the doors was shredded. I re-screened them with pet screen, or something like that, which is supposed to be pet proof...we'll see. 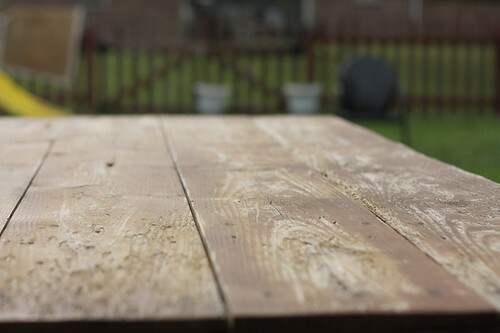 I wanted to get to oiling the wood on the screen doors and my farmhouse table top, but I had a little accident. I stepped on a bee. Sounds like a harmless enough incident, right? It hurt like hell and my foot swelled up, which should have been the end of it. This morning (Sunday) it still hurt like hell and was quite swollen. I took a look and saw that it was getting infected (i won't go into details). Ick! I've never had anything like that happen before, but I guess on the bottom of the foot it can easily happen. I'm always barefoot, but I'm starting to reconsider. So here I am with my foot propped up trying to entertain myself with TV and some hand sewing, which is KILLING ME! Sitting still when I'd rather be outside painting my patio furniture (also on the agenda for this weekend) is no fun at all. Sitting still in general is not my thing. I suppose I could start folding the laundry, but I'm not that desperate yet! Back in Matt's college days, he had a fondness for beer (go figure). A favorite hangout of his was the Chimes, which is known for its extensive beer menu. A popular thing to do is to go 'round the world'. I'm not sure if it's the same now as it was back then, but I see on the website that means 60 beers from 20 countries. From what I remember, you had to sign up for it, you got a card that was kept on file and on that card you could check off what you drank. Once you met all the requirements - the 60 beers from 20 countries - you got a t-shirt and your name on a plaque that hangs in bar. Oh, you also had to do this within a certain time limit, 6 months maybe? Well, my dear husband did this. Twice. I tried once, but I couldn't do it. 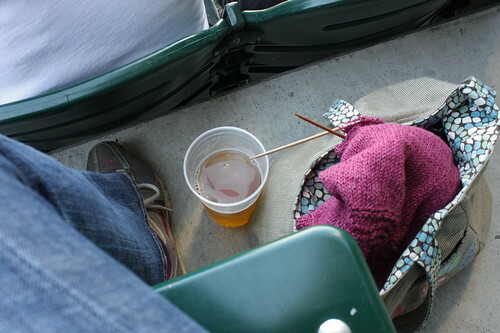 For one, those imported beers are expensive, which is tough to do on a student budget. And sometimes they're yucky. 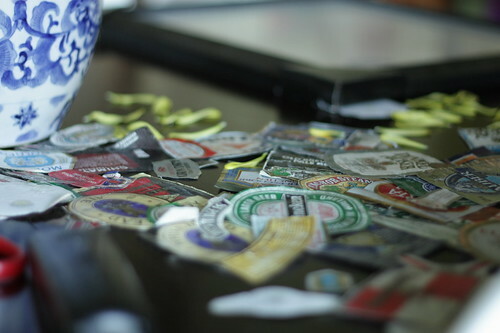 Anyway, on one of his trips 'round the world' he decided to peel the labels off the bottles and save them. All this happened before my time, so I don't know all the details. 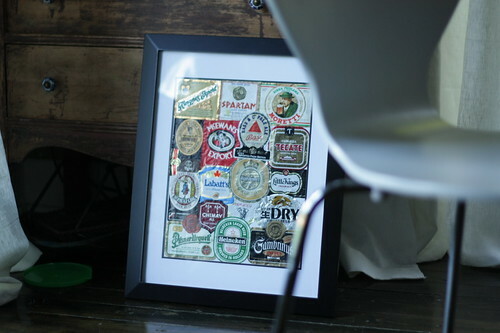 He collected them by sticking them to a big sheet of paper all willy-nilly in a poster frame (I think it is the sheet that comes in the frame that has all the dimensions). It was quite classy, let me tell you. I'm sure it was the prize of his bachelor pad. I love personal mementos, so I never made him get rid of it. It never hung on our wall, but it stayed out of the trash. One day I got the idea that it would be pretty cool to frame those labels. When I pulled the sheet out of the frame I thought there was no way that I could salvage them. I thought about slicing up the sheet with the labels attached, but I wasn't too keen on that idea (willy-nilly, remember?). With some time and a lot of patience, I was able to remove most of the labels from that sheet of paper. I then trimmed some of the labels, removed bar codes, and arranged them neatly. I filled up two frames and have still have labels left over. 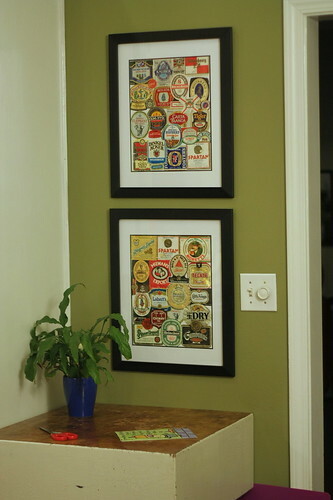 For being a bunch of old beer labels, I think it turned out pretty nice...nice enough to hang on the wall of our house. Needless to say, Matt was very pleased. I was going to wait until I finished this, but I'm not sure when that will happened. 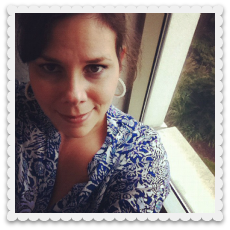 Too often, I've put off blogging about something because it wasn't done enough. Well, this is done enough for you to get the idea. I still need to go back over a few spots, but I'm hoping that doesn't show up in the photos. Do you remember this cedar armoire? I went back through all my flickr photos to find one that showed it in its originality and this was the closest I could find - please excuse the clutter. This was taken when we strarted our kitchen/dining re-do, oh, over 2 years ago. I think I had just painted the walls here. This armoire was made in the 50's (it has a date on the back) and belonged to my great uncle. At the time I inherited it, it had been in storage in his shed. The finish was always icky. 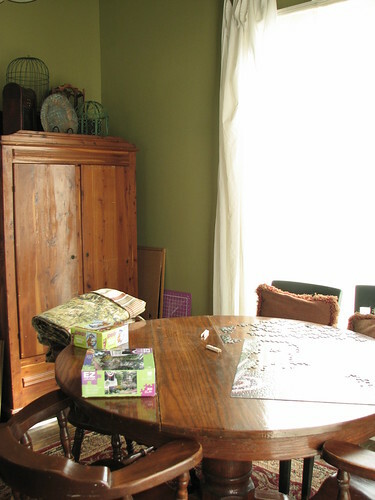 Once we started changing up our kitchen/dining, I gave it a white wash, just to get rid of the cedar look. I never really loved it, but it was a change. It ended up looking a little too shabby for my taste, but it was better than before, I thought. I didn't know what I wanted to do with it, so I lived with it. Now, here it is in gray with white detailing. Isn't it fancy? I was amazed at what a difference the white detailing made - it really pops! 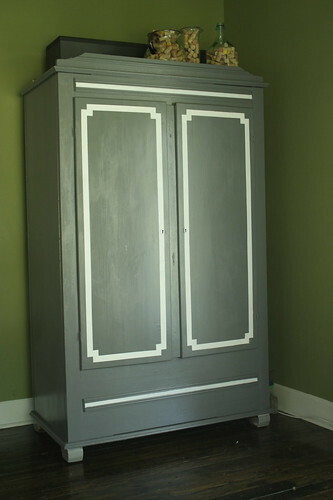 My old cedar armoire now has a new life. 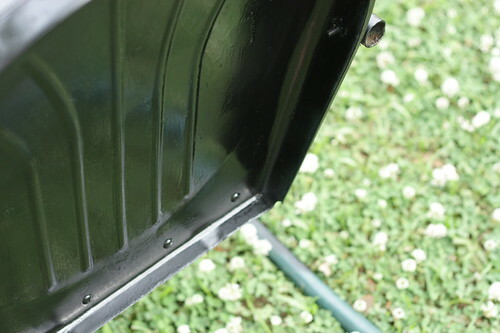 I love giving an old piece of furniture a new look with a fresh coat of paint. Like I said, it isn't perfect - there are a few spots that need some touching up, but I ran out of white paint and I haven't made it back to the store yet. 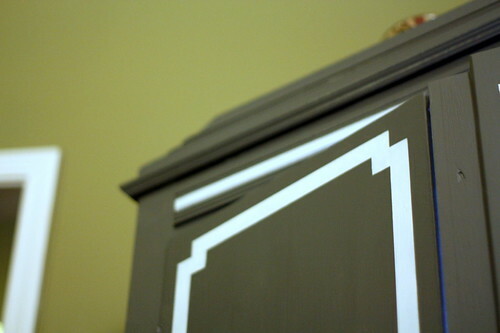 What you're seeing in the corners of the right door is actually primer. I did the corners of each door different, then decided that the one on the left was my favorite, so the right door corners got primed out. My dining area is almost done, but I'm not sharing it just yet. There's a project in the works to hang on the wall, and I'm still on the hunt for 2 end chairs for my table, but if I don't find those chairs in the near future I'll show you anyway. Could it be that I actually finish a room? It will be a first! 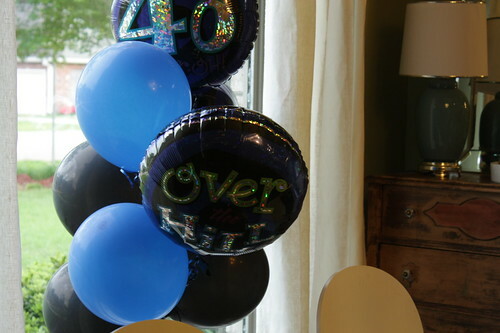 Well friends, the birthday season in the artsy-crafty household has begun! 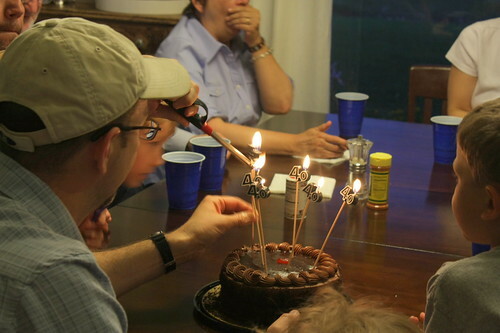 Today Matt hit the big 4-0. We started celebrating this weekend with a little family getaway. 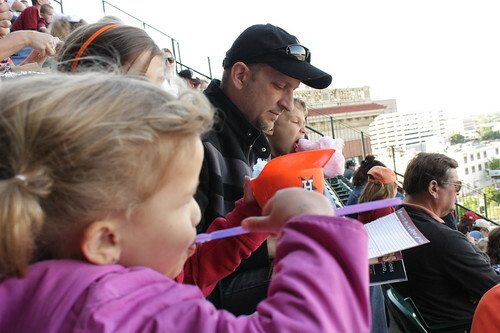 We went to Houston to watch an Astros game. It was fun to do something that we don't normally do. Matt is a total sports nut, so anything sports related is right up his alley. It's kind of funny that he married a girl with absolutely no athletic ability (or interest) whatsoever - but if it makes him happy, it makes me happy. Our trip wasn't all sports all the time, there was plenty of exploring and just hanging out. Lucky for us, the weather was beautiful. 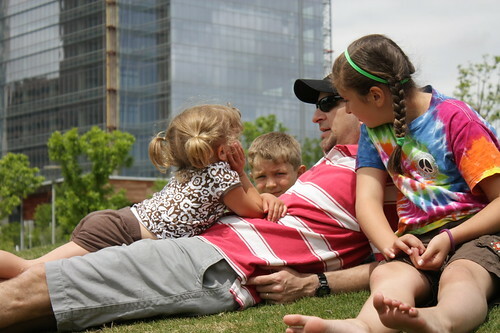 Can you tell that these children (and I) adore their father? They should because he's a good one. I most definitely scored in the 'husband/good daddy' department. Tonight we had a little party at home with family. Pizza, cake and ice cream - easy peasy, just the way we like it! We're lucky to have Matt's parents and his sister and her family live nearby. When we all get together on occasions like this I feel fortunate to have married into such a great family. 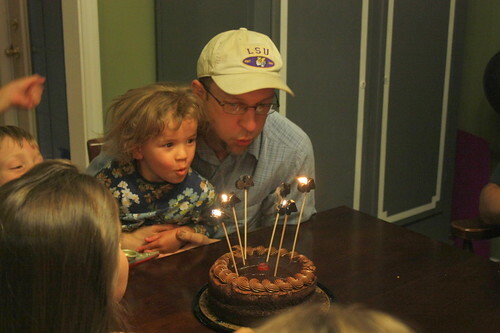 We'll be seeing a lot of each other over the next month or so - there must be something in the water around here in the late summer months because there is a birthday explosion. By the time Alex's birthday rolls around in June, we'll be sick of birthday cake...and broke from buying gifts. But today is Matt's special day. Happy Birthday, Matt! I love you!! !